The Scientists/Artists Research Collaborations (SARC) initiative was piloted during Summer 2012 as a project of 516 ARTS, for ISEA2012 (International Symposium on Electronic Art), just held in Albuquerque, Los Alamos and Santa Fe in late September. SARC research institution partners to date are the Los Alamos and Sandia National Laboratories, with the collaboration of University of New Mexico’s Center for Advanced Research Computing (CARC) and Santa Fe Institute. 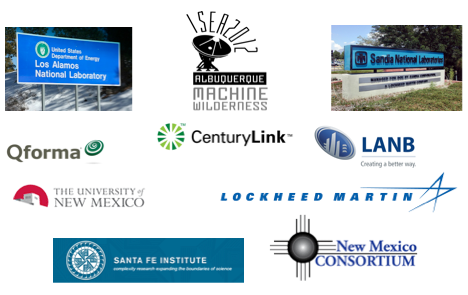 SARC has been funded to date by Lockheed Martin/Sandia National Laboratories and the New Mexico Consortium, with additional supporting company sponsors: Los Alamos National Bank, CenturyLink/Qwest Communications and Qforma. Ruth West, U. of North Texas, Denton, TX (formerly at UCSD Center for Research in Computing and the Arts, San Diego). Francesca Samsel, working w/ visualization labs at UT El Paso and UT Austin, TX. William Ray Wilson, (Navajo) Institute of American Indian Arts, Santa Fe, NM. SARC co-directors and artists initiated preliminary interactions and discussions on-site and remotely during the Summer, with a July visit and follow-on communications with science research teams at Los Alamos and Sandia National Labs, Santa Fe Institute and UNM. In this first phase, the SARC artists and science research teams brought up shared interest and experience in cross-disciplinary work with large data sets, complex eco-systems modeling and applications, food and health issues, advanced visualization and sonification techniques, cognition, memory and perception studies, and creative talents applied to critical social and environmental understandings, decision-making processes and problem solving. SARC did not contrive to immediately pair up an individual scientist with an artist; nor did it simply expect pre-proposed projects to be the basis for collaboration. It instead intends that groups of artists and scientists begin to communicate among each other, to meet in scheduled site visits and begin to have in-depth discussions about the nature of art-science collaborations; about the potential extents and limitations of what may reasonably be accomplished through initial interactions; and about areas of joint research which may emerge, and may be considered for ongoing collaboration and support. Rapport among individuals, funding, and researchers’ allocation of time were understood to be among essential collaborative determinants. The SARC Summer pilot program resulted in the following outcomes, deliverables and ongoing efforts, beginning with July artists and scientists meetings, interactions and presentations. Fri., July 6: SARC initiated its commitment to education and public outreach with a special “3D-VIS” presentation, featuring the latest active 3D visualizations produced by LANL and Sandia teams, as a special program of the Currents: Santa Fe International New Media Festival. July 9 and July 11: SARC artists had arranged presentations/discussions with potentially interested science researchers a Sandia Labs/CERL and at LANL. During July, artists and guests given security passes, also toured the ‘restricted’ Vault behind the fence at LANL, to see demonstrations of active 3D visualization facilities: the CAVE (La Cueva) and the Powerwall, with presentations of nano-structures, asteroid impacts, explosion dynamics and ribosome structures. Scheduled meetings with LANL researchers were held in conferencing/workspaces provided at the New Mexico Consortium. From September 15 through 25, SARC conducted three public panels/presentations and a private, invitational Working Group meeting at Santa Fe Institute, in conjunction with ISEA2012. Saturday, September 15, 1:00-5:00 p.m.: ISEA2012: “Art & Science: a presentation at the Bradbury Museum in Los Alamos, a featured program of “The Next Big Idea”, presented and discussed the processes used by the artists and scientists during their collaborations. Monday and Tuesday, Sept. 17 and 18: Santa Fe Institute, SARC Working Group, with 20 invited (national) participants, discussed the future of SARC and Art/Science in general, with a focus on pragmatic next-phase strategies. A major focus and action-agenda item was curriculum for art/sci (STEAM) education, as well as funding options. We were fortunate to be able to coordinate agendas with NEA and SEAD representatives. In addition to SARC directors and artists, participants included: Laura Monroe, LANL; David Rogers, Sandia Labs; Bill O’Brian, NEA; Deana Pennington, UT El Paso; Carol LaFayette, TAMU and Roger Malina, UT Dallas; Andrea Polli, UNM; Thomas Caudell, UNM; Jim Crutchfield, UC Davis; David Dunn; and Jennifer Dunne, SFI. Thursday, September 20, 9:00-10:20 a.m.: ISEA2012: “SARC: Art & Science”: artists and science researchers’ presentations at the Natural History Museum in Albuquerque. An exhibition of ISEA2012 Residency works (w/ SARC) opened at UNM School of Architecture, on Sept. 19th. SARC information is on the ISEA2012 web site and in the ISEA2012 catalogue and all publications. Tuesday, September 25, 1:30-3:30 p.m.: ISEA2012: “Art & Science: The SARC Process” presentation at Santa Fe University of Art and Design, with participation of 25+ students from New Mexico School for the Arts, and a class from Santa Fe Community College, plus many US and international ISEA2012 participants attending Santa Fe Day events. Leonardo, an M.I.T. Press publication, will feature an editorial on SARC, and the NSF funded SEAD (Science, Engineering, Art, Design) initiative will publish a ‘white paper’ on the SARC program, including intended next phase efforts. The New Mexico Consortium prepared a SARC press release, and an article for Essence, Los Alamos’ monthly events paper, in coordination with the 2012 Next Big Idea Festival. Development of SARC higher education programs is currently in early stage discussions with UNM, SFUAD, IAIA, UT Dallas, UC Davis, other university contacts and funders. A newly forming Advisory Group, currently includes Andrea Polli, Associate Professor of Art and Ecology, at UNM; Roger Malina, Professor, UT Dallas, and Executive Editor of Leonardo Publications at M.I.T Press; Laura Monroe, Ph.D., Los Alamos Laboratory; Ruth West, University of North Texas (formerly at UC San Diego). The SARC Pool, an ever-extended pool of creative collaborators, has been initiated with 12 of the original project applicants, plus many more internationally based artists.